As EU leaders meet and decide what to do about the swathes of migrants dying in the Mediterranean - 900 people are believed to have drowned on another rickety ship from Libya bound for Italy and crammed full of desperate men, women and children. In what's been described as the worst disaster on the Mediterranean Sea yet, only 27 refugees survived. The Tunisian captain has been arrested and charged by Italian authorities with multiple homicide. A Syrian crew member has also been charged with facilitating illegal immigration. Prosecutor Rocco Liguori said: "We carried out two arrest warrants of suspected traffickers, the captain of the ship that capsized and a member of the crew. We charged them both with facilitating illegal immigration and the captain was also to be charged with multiple manslaughter." "The migrants were crushed inside this fishing boat…a few hundred migrants were forced into the hold, at the lowest level, and they were locked in and prevented from coming out." "Another several hundred were closed into the second level, while on the top, under a cover, there were another hundred migrants." Twenty-four bodies were retrieved from the water near Malta, but the majority of people, families with babies and toddlers drowned along with the sunken boat. 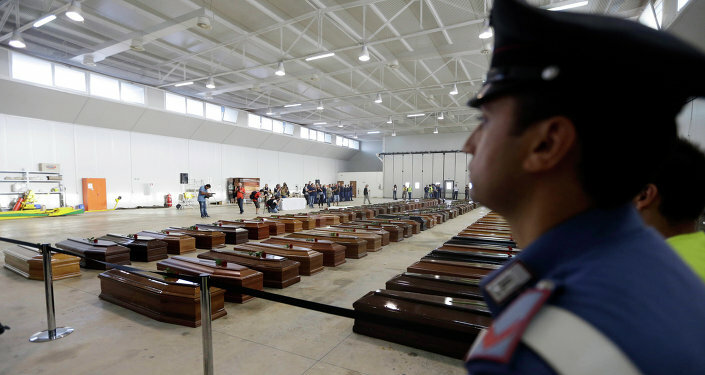 Smuggling on the high seas peaks during the summer months when conditions are more favorable, despite this more than 1,750 migrants have died in what's now known as the 'Mediterranean graveyard' since the start of this year. That's more than 30 times higher than the same period of 2014, according to the International Organization for Migration. Almost 90 percent of the boats begin the perilous crossing in Libya where in 2011 military intervention by France and the UK removed the country's leader Colonel Gaddafi from power. Nabila Ramdani, journalist and Middle East commentator told Sputnik News: "A network of smugglers are taking advantage of this grim situation sending thousands of people to their deaths. "We're witnessing a correlation between the absolute disaster of the situation in Libya and the number of deaths on the Mediterranean Sea. Entire families are leaving war torn countries including Iraq and Syria and Libya is now in a permanent state of lawlessness. Libya, in short, is gradually becoming a new Somalia, a failed state threatening the safety of all of us." Nabila Ramdani expresses personal outrage of the British and French bombing campaign which she says, "assisted in the destruction of Libya during the Arab Spring without any thought for the consequences. "Bombing made the situation infinitely worse. The sponsored overthrow of Gadaffi was shortsighted and has left only chaos." "British Prime Minister David Cameron and other western politicians need to acknowledge their failure. "This isn't just a disaster for Libya but for all of us." "Western leaders need to assist the people in the country and continue to protect civilian lives, which they pledged to do when NATO intervened," said Ramdani. The fall of Gadaffi in 2011 led to a break up of Libyan society, according to Ramdani. "Weapons smuggled in by western powers to use against Gadaffi's forces left them available for rival militias. Islamic State in Libya is increasing and is behind a range of attacks in the country." Ramdani believes targeted air strikes could certainly go a long way in dealing with the specific threat from ISIL. "But more crucially," says Ramdani, "western politicians, especially Britain and France should work with the governments of Libya to build up viable institutions. The solution can only be a political one. When you have institutions in place you can sort out law and order and that's a priority in order to stem the violence and prevent people fleeing on mass." So what are the EU leaders planning to do about it? Matteo Renzi, the Italian prime minister told a press conference with his Maltese counterpart Joseph Muscat: "Attacks on death rackets, attacks against slave traders (traffickers) are in our thinking." The European Commission, backed by EU foreign and interior ministers have put forward a ten point plan. The EU will reinforce maritime patrolling operations with more money, equipment and patrol times. The vessels are as valuable to the people smugglers as the human cargo on board. Migrants pay traffickers a hefty fee to travel by sea. EU leaders say they will make a systematic effort to destroy boats used by people smugglers. EU law enforcement, border control, asylum and prosecutors' agencies will meet regularly and work closely to gather more intelligence on how the smugglers operate. The EU will also deploy liaison officers abroad to gather more information on migratory flows and increase EU delegations. The EU's asylum support office will deploy more teams in Italy and Greece for joint processing of asylum applications. All rescued migrants will be fingerprinted and 'emergency relocation mechanisms' will be considered, whilst the European Commission will begin a pilot project on resettling refugees across the EU. A new rapid return program for 'irregular' migrants will be co-ordinated by Frontex and EU's Mediterranean countries. And the EU will also engage with countries surrounding Libya. For the 27 migrants who survived what has been described as the worst migrant shipwreck, their journey for survival continues.